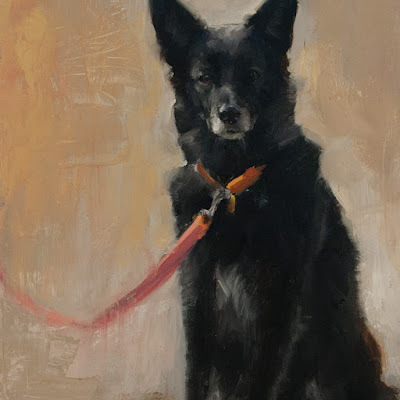 Black dog, leashed, (detail) oil on panel 12" x 12"
Black dogs get a bad rap. Winston Churchill famously referred to his depression as a black dog. But in Ian McEwan's postwar novel Black Dogs, which I read a few years ago, the black dogs symbolize a greater malignity, something not specified directly, but glimpsed peripherally as a looming menace over Europe. And then there's the so-called black dog syndrome which suggests that black dogs are less likely to be adopted--perhaps because of their association with depression and evil. 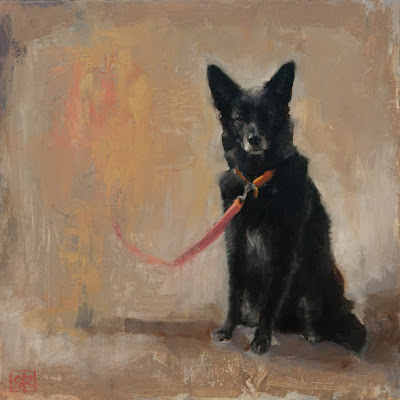 Black dog, leashed, oil on panel 12" x 12"
I was painting this black dog stoically waiting for his owner when I heard about the death of groundbreaking editor of Elle magazine in the UK, Sally Brampton. She'd written a book about her own struggle with depression called Shoot the Damn Dog, which I haven't read, but which resonated a little as I painted with all these associations in my head. This dog, leashed and waiting, looks too benign to be a threat, but I won't discount him entirely. It's easy to glimpse black dogs today in the lead-up to the American election, the refugee crisis, global warming... I really should stop listening to public radio in the studio. Nicely captured. I have a black dog and I cannot get a good photograph of her. I don't listen to public radio in my studio either, unless it's music. I can't have that interfere with my creative process. Yes, a black dog is a challenge to paint and photograph. All the close values make it easy to overemphasize the contrast. I'm always torn between music and the spoken word--the stories of the day certainly colour the mood in the studio, but it's nice to have the company.